The first official indication that a family service for Michael Jackson will be held at Forest Lawn Cemetery came from a Los Angeles police official Sunday. Forest Lawn officials were working with the Jackson family on their plans, which were part of “a package” of events Tuesday, said Jim McDonnell, assistant chief of staff of the Los Angeles Police Department. His comments, however, did not answer questions about where or when Jackson would be buried. While there are five Forest Lawn cemeteries in the Los Angeles area, a long line of media trucks and crews have been parked at the gate of the Hollywood Hills facility for several days in anticipation of Jackson’s possible interment there. The family of the singer, who died June 25, has given no public statement on the planning. However, brother Jermaine Jackson told CNN on Thursday that a private service would be held Tuesday morning. Tuesday, join CNN for all day coverage as the world celebrates the life of a worldwide pop icon, and don’t miss our prime time coverage starting at 8 ET. 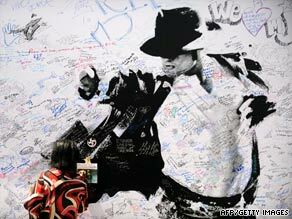 A public memorial for Michael Jackson at the Staples Center in Los Angeles is set to start at 10 a.m. PT Tuesday. McDonnell said police do not expect a Jackson motorcade to take place on Tuesday. An official with AEG Live, the concert promoter handling the public memorial plans, said there would be no funeral processional. About 1.6 million fans registered for a chance at fewer than 9,000 pairs of tickets to the memorial service, organizers said. Registration ended at 6 p.m. Saturday. The 8,750 registrants picked in a random drawing were to receive an e-mail Sunday after 11 a.m. PT, AEG Live said. Tickets will be handed to the winning registrants Monday outside the Staples Center, said Tim Leiweke, president of AEG Live. Ticketholders will also have wristbands to match their tickets, a precaution against people “trying to take advantage” of the system, he said.